WASHINGTON (AP) — Supporters of LGBT rights marched and rallied in the nation’s capital and dozens of other U.S. cities on Sunday, celebrating gains but angry over threats posed by the administration of President Donald Trump. The centerpiece event, the Equality March in Washington, was endorsed by virtually every major national advocacy group working on behalf of lesbian, gay, bisexual and transgender Americans. Activists have been embittered by the Trump administration’s rollback of federal guidance advising school districts to let transgender students use the bathrooms and locker rooms of their choice. They also complain that Trump, who campaigned as a potential ally of gays and lesbians, has stocked his administration with foes of LGBT rights, including Vice President Mike Pence, Attorney General Jeff Sessions, and Health and Human Services Secretary Tom Price. 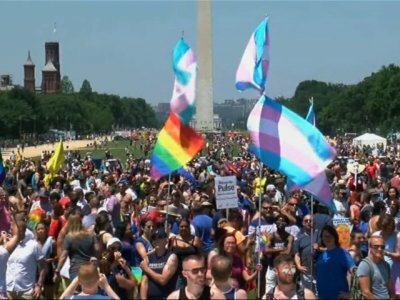 Throngs of marchers, many thousands strong, paraded past the White House and toward the Capitol, trailing behind a giant rainbow flag near the head of the procession. “We’re here, we’re queer, get that Cheeto out of here,” was among the chants directed at Trump. For the LGBT community nationwide, it’s an emotional time. Monday is the anniversary of the mass shooting a year ago in Orlando, Florida, that killed 49 people — mostly Latinos — at Pulse, a gay nightclub. Among the marchers in Washington was Gil Mendez, a Puerto Rican native who traveled with his partner all the way from San Francisco to join the parade. He carried a sign that included the names of all the Pulse victims. Also marching, and singing freedom songs and patriotic songs along the way, were scores of members of gay choruses from various cities. “It’s an opportunity to tell everyone we’re still here, and we’re not going away at all,” said Gregory Elfers of Teaneck, New Jersey, who was with a contingent from the New York City Gay Men’s Chorus. “We have to be heard — we have to be sure we’re not trampled on,” said L. Owen Taggart of Washington’s Gay Men’s Chorus. The roughly 100 marches and rallies across the U.S. included the first-ever gay pride parade in Grosse Pointe, a prosperous Detroit suburb. It began at Grosse Pointe South High School to emphasize support for teens who are gay or transgender. Back in Washington, the activist leaders on hand included Sarah Kate Ellis, president of GLAAD, which monitors media coverage of the LGBT community. She noted that Trump, breaking from the practice of Barack Obama, has declined to issue a proclamation in honor of Pride Month, and that the Trump administration has deleted questions about sexual orientation from planned federal surveys. David Crary reported from New York. Associated Press writer Amy Taxin in Los Angeles contributed to this report.